← ‘Desert’ at Latitude this weekend. New Dates for Chelsea Manning play. After ten minutes of torrential rain bouncing off the paved square, it eased off enough to venture out again. 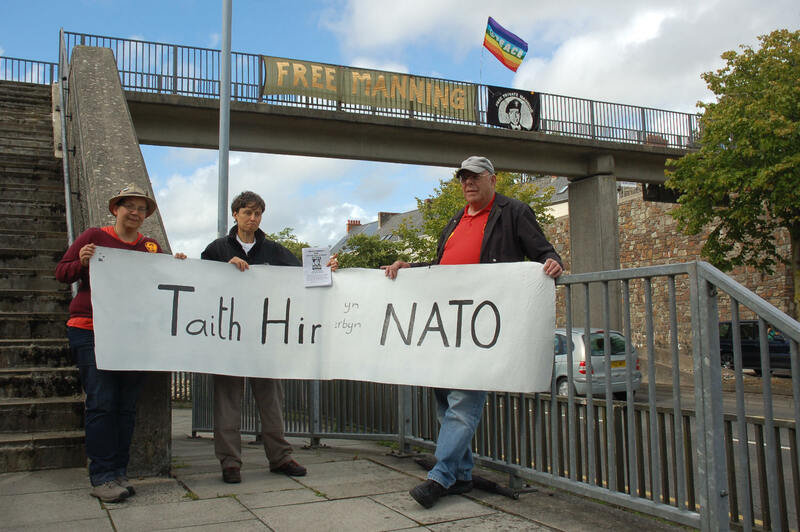 The Long March on Newport contingent for the day – Marie, Denis and Stef – arrived and we set about making ourselves visible at the top end of the square to show our solidarity with Chelsea Manning, our opposition to NATO and the link between the two as explained in our flyer. Chelsea (formerly Bradley) Manning… blew the whistle on war crimes and exposed the west’s wars including the NATO-led war on Afghanistan. 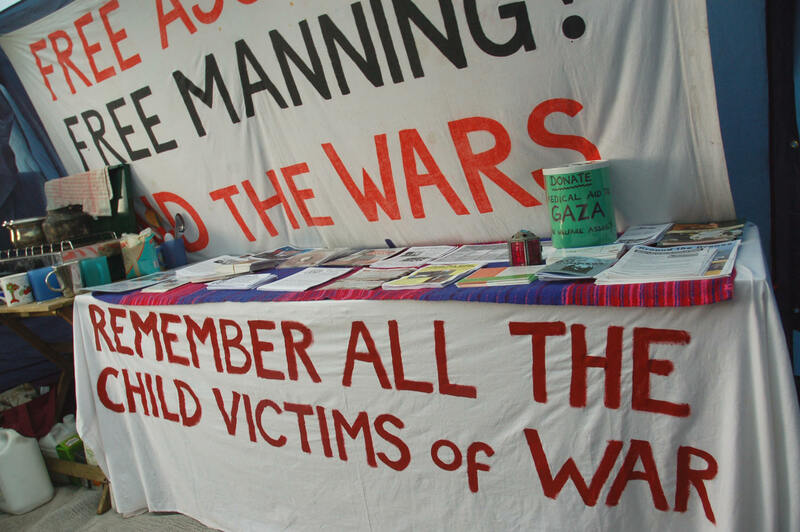 Manning is serving 35 years in a US military jail for speaking the truth, while those who perpetrated the crimes she exposed have never been brought to justice. 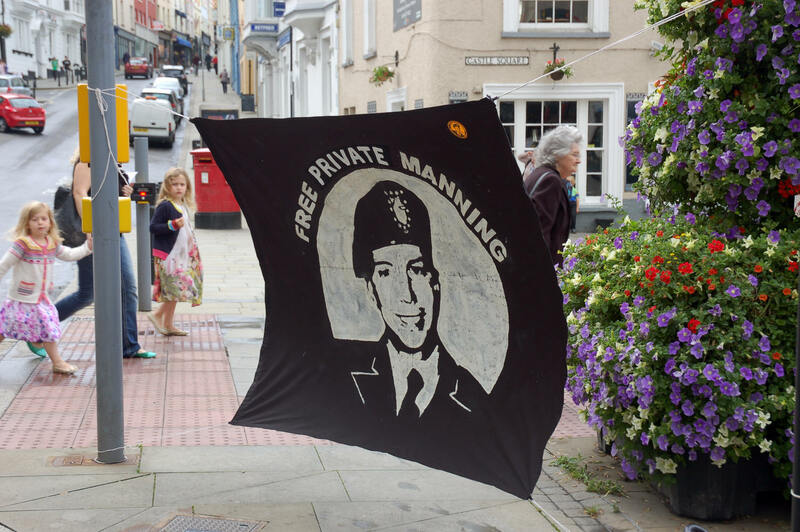 Amnesty International has recently called for Manning’s immediate release. 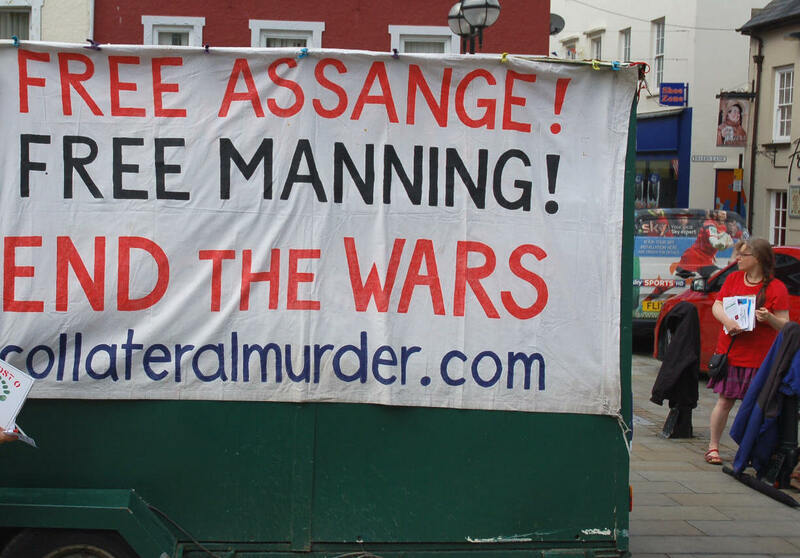 The leaflet goes on to outline some of the lies about and cover up of the NATO-led war in Afghanistan that Manning revealed in the leaked war diaries and in Cablegate, both of which WikiLeaks has now made available in fully searchable format. Additional revelations in Cablegate expose NATO’s intentions in Ukraine and corruption in the appointment of the current Secretary General of NATO, Anders Rasmussen. 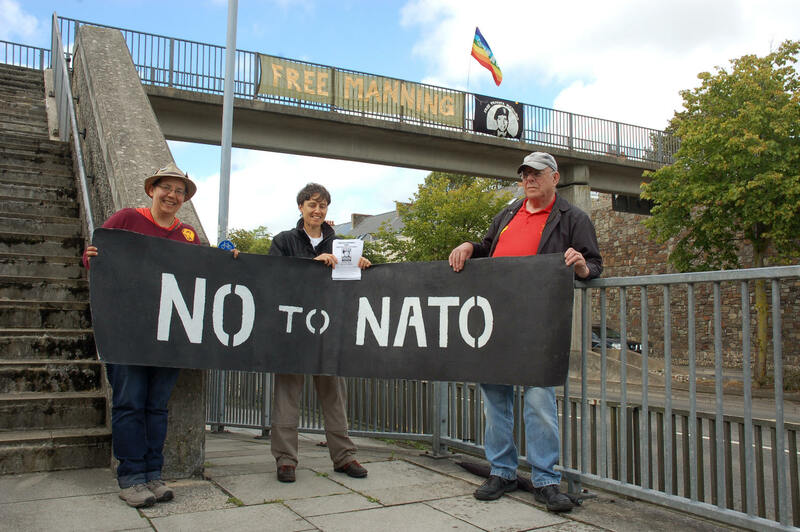 Many people expressed strong views about NATO and completed postcards with their messages to NATO leaders that are being collected along the march and will be presented during the summit in September. 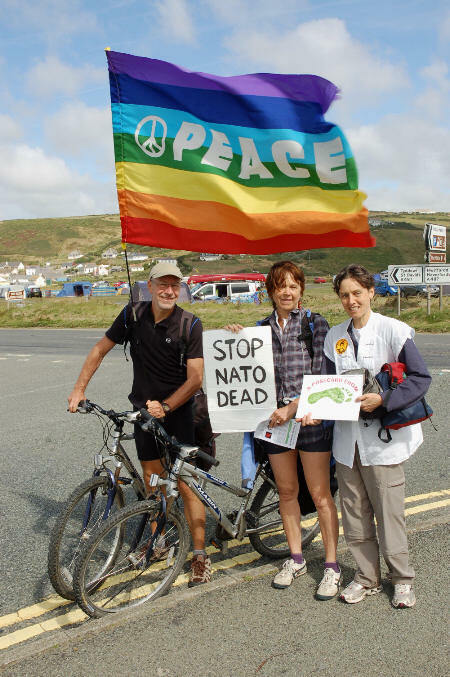 Recurring themes were civilian deaths in NATO’s wars and calls for NATO to be disbanded. Our fluorescent orange FREE MANNING stickers were popular, especially with kids. One member of this cute trio posing here for a photo was another Chelsea. After a brief break for a showery picnic lunch by the river, we were back in the square for round two and were joined by local supporter Berry. More people wrote postcards and more stopped to chat, some to thank us for being there with a visible presence. 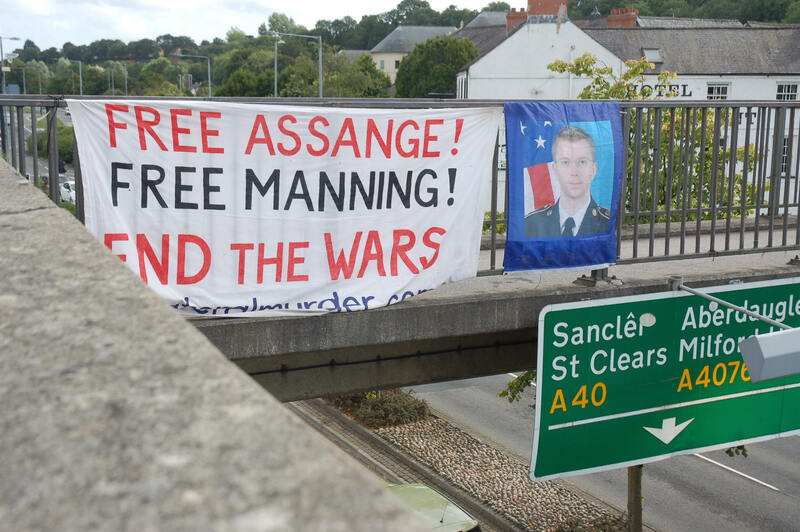 After a short tea break, we headed over to the A40 in time for the evening rush hour for a banner drop from the footbridge to communicate our solidarity with Chelsea Manning to drivers travelling in both directions along the dual carriageway. It had been breezy on Tuesday but it was blowing a gale when Marie, Denis, Freddie and I arrived at Newgale beach on Wednesday as the Long March headed north towards St. David’s and Fishguard. A couple of Italian cyclists offered their support and wrote a postcard; well aware of the NATO summit, they spoke about protests in Italy as well as over here. 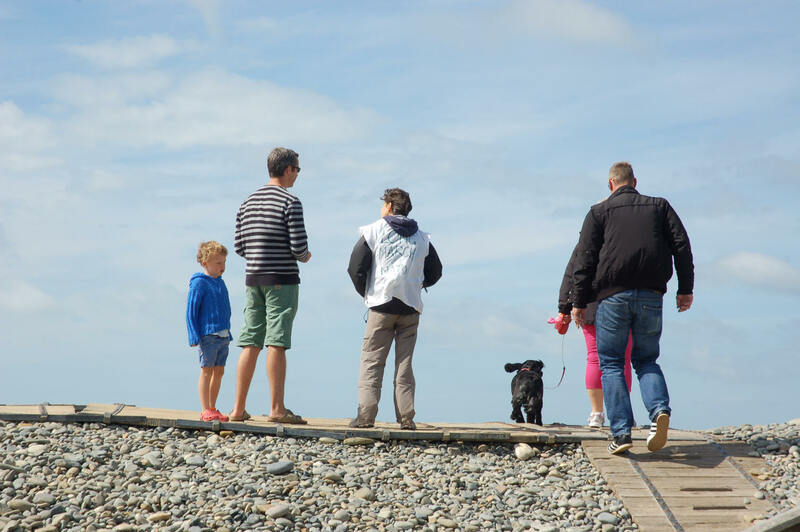 More conversations were had as we made our way along behind the beach on the bank of pebbles newly reconstructed after the winter storms. Back in February, passengers had to be rescued after a local bus had its windows smashed by huge waves and was left stranded in flood water. A mile or so out of Newgale, once the steep hill had levelled out, Brawdy military base came into view across the fields. This is the base where Chelsea’s father Brian Manning was stationed in the 1970s; the US Navy unit based on the site was the processing centre for a network of underwater microphones designed to pick up the propellor sounds of Soviet submarines. The US and RAF left the base years ago. Now known as Cawdor Barracks, it is currently home to 14 Signal Regiment, the British army’s electronic warfare unit. I turned back at Brawdy after taking a couple of shots with the base in the background, leaving the others to carry on to Solva, where a new screen version of Welsh poet Dylan Thomas’ play Under Milk Wood has recently been filmed. The start of World War I is not the only centenary in 2014 – Thomas, who held consistently anti-war views, was born 100 years ago this October. 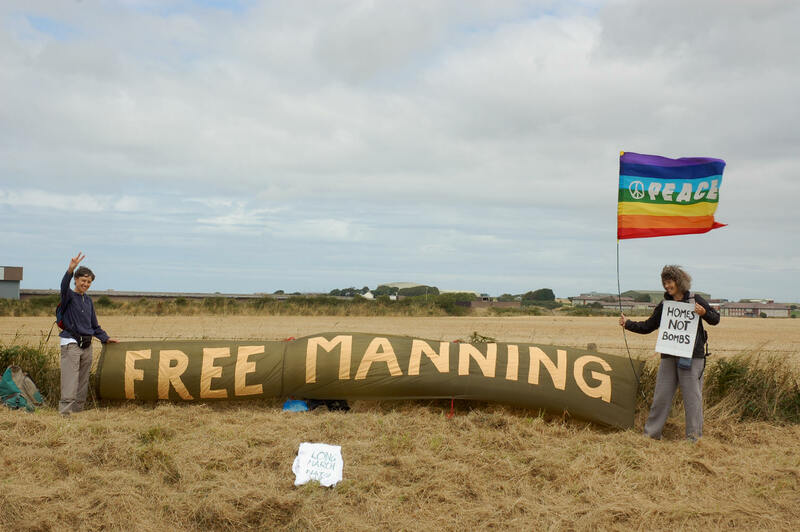 Chelsea Manning has not been forgotten in Wales, the borders or – it seems – in places with strong connections to Wales. There is a strong connection between the Hunter Valley of New South Wales and Wales in the UK. Many coal miners migrated here from Wales (also from England & Scotland) in the late 1800s and early-mid 1900s. Lots of Welsh names are around here like Cardiff, Swansea, Abermain, Pelaw Main, Spion Kop, Neath etc. 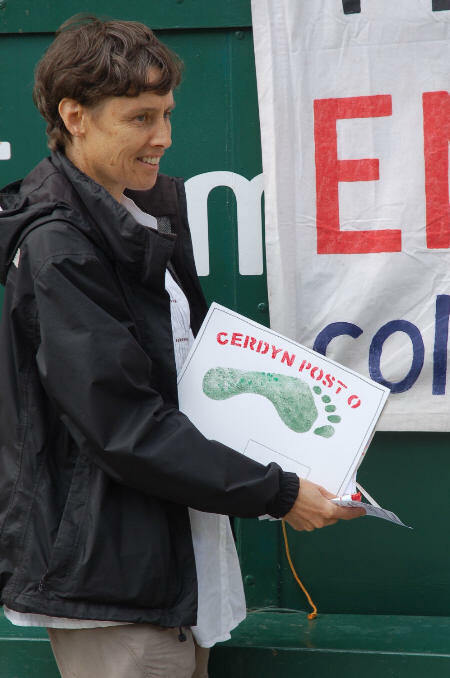 Also the cultural tradition of the Eisteddfod still continues. A copy of the certificate is being sent to Chelsea. 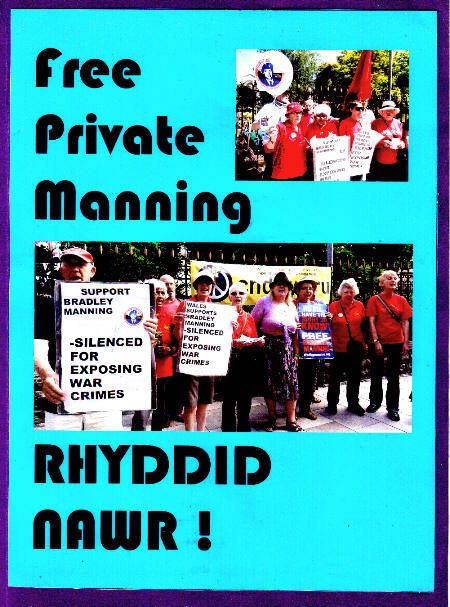 Côr Cochion, Cardiff Reds Choir, have donated collections made during their regular singing sessions in Cardiff city centre to the Private Manning Family Fund and have sent a card to Chelsea in prison signed by members of the choir. 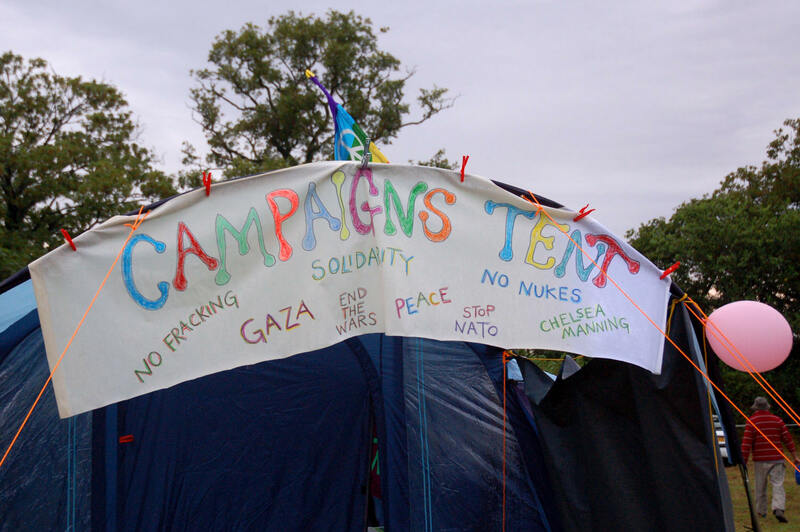 On the weekend of 2 & 3 August, a campaigns tent at the Something Else A Bit North gathering near Malpas in Cheshire included information about Manning as well as many other issues. The US pressured the European Union to list the political wing of Hamas as a terrorist group. An investigation into the bombing of UN schools by Israel in 2009 found nothing to suggest Hamas was using them to shelter in, nor using civilians as human shields. Israel admitted to using Palestinians as human shields on more than 1,200 occasions. Israel admitted incendiary phosphorous shells were fired over civilian areas. Israel admitted to the US that its official military strategy is to deliberately target civilians. After 2006, Israel decided to use ‘disproportionate force’ in any future attacks. Israel’s strategies in Gaza include manipulating the economy to keep it near disaster at all times. 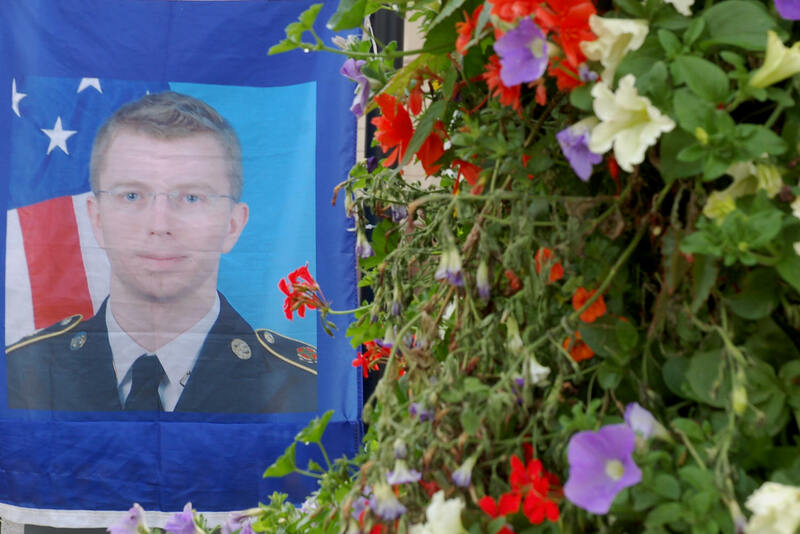 Chelsea Manning has sacrificed her freedom to bring us these truths. It’s up to us to make use of them and share them. 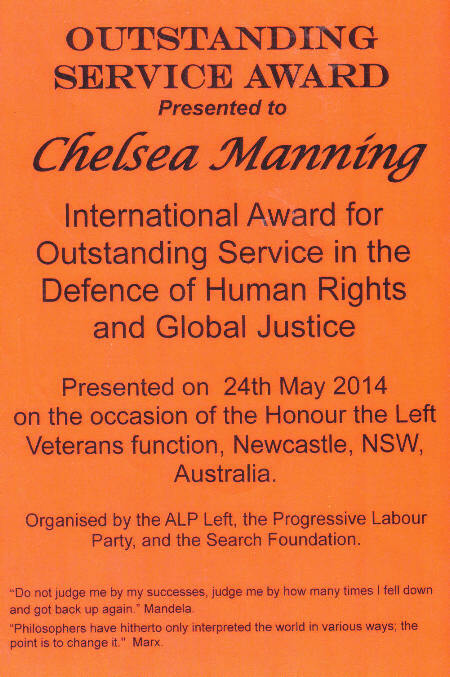 FREE CHELSEA MANNING! 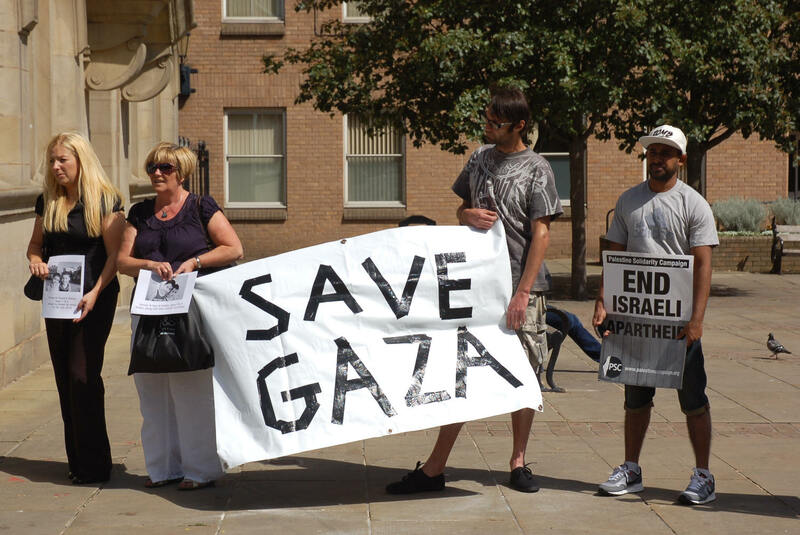 SAVE GAZA! 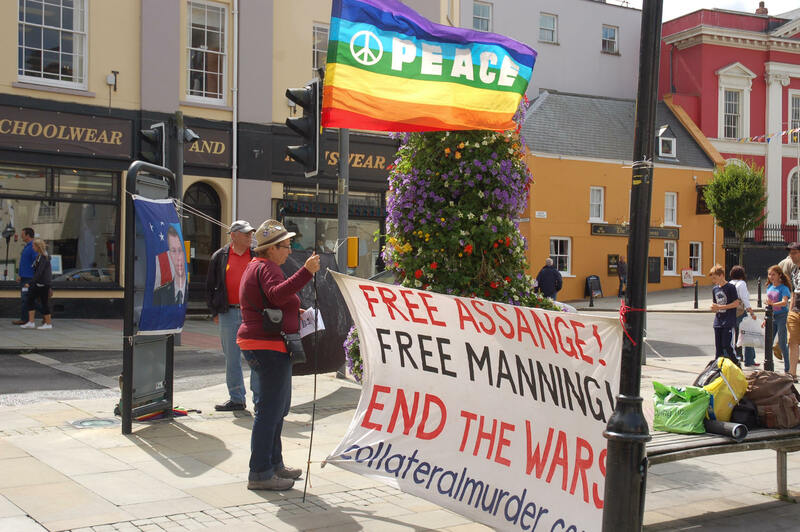 Gallery | This entry was posted in Manning, Reports, WikiLeaks and tagged Bradley Manning, Brawdy, Cardiff, Chelsea Manning, Cor Cochion, Dylan Thomas, Gaza, Haverfordwest, Hunter Valley, Long March on NATO, Malpas, NATO, New South Wales, Newgale, Newport, Pembrokeshire, protest, Solva, Something Else Festival, Wales, WikiLeaks, Wrexham. Bookmark the permalink.